For the Seattle bootcamp, we offer four different packages: Dojo2, Dojo3, Guru, and Sensei. The Dojo2 and Dojo3 packages are for the first two days of the training and the last three days of the training, respectively. Please note, the Dojo2 and Dojo3 packages are specific to Seattle, only. The Guru and Sensei packages are for the full five-day bootcamp. At full price, the packages range from USD $2999.99 to $4499.99 at full price. Once we announce a bootcamp, we start off with our early-bird discounts of 30% off. Discounts are available in limited quantities and offered on a first-come, first-served basis. We have a limited number of seats at each discount tier and once we sell out of discounted seats, we move to full price. 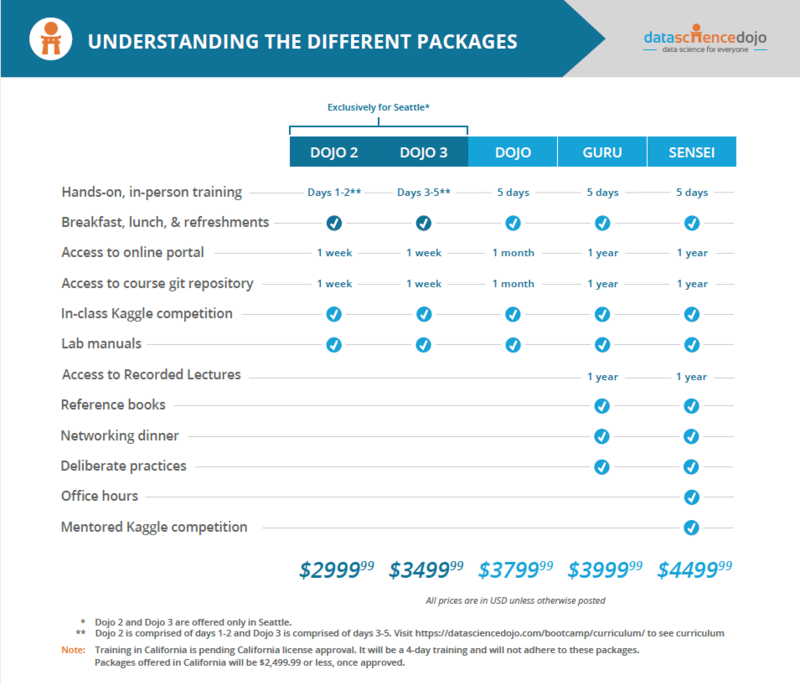 You can find what is included in each bootcamp package at https://datasciencedojo.com/locations/seattle/#pricing/ or view our bootcamp package comparison directly. First two days of the same five-day bootcamp. Anyone who registers for the Dojo2 package, will attend the first two days of the same bootcamp as those that purchase the Guru or Sensei packages. This is great for folks who can’t take off the whole week, but could come back another time to finish the course and take Dojo3, the last three days. Learning material – includes 4 Data Science Dojo Lab Manuals and a folder with cheat sheets. Kaggle Competition – start building your data science portfolio with a Kaggle project under your belt. Last three days of the same five-day bootcamp. Anyone who registers for the Dojo2 package, will attend the first two days of the same bootcamp as those that purchase the Guru or Sensei packages. Includes everything from the Dojo2 and Dojo3 packages. Deliberate Practices – Get access to practice exercises with different data-sets on our online lab environment. Hone your new skills after the bootcamp. Recorded Lectures – Watch recorded videos for all sessions after the bootcamp to revisit concepts. Includes everything from the Guru Package. Office Hours- Struggling with any of the topics covered in the bootcamp? We can help with two half-hour sessions with one of the instructors. Mentoring for a data science project – Get mentored by industry experts on a post-bootcamp Kaggle competition. For a further breakdown and description of each item, check out this article, here.